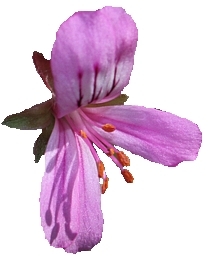 Erect to decumbent, non-aromatic to aromatic, non-viscid or viscid subshrubs or shrubs with rather woody stems. Leaves simple, laminae entire to variously palmately or pinnately incised. Inflorescences: flowering branches with smaller and normal foliar leaves or smaller foliar leaves only, pseudo-umbels with 1-20 flowers each. Flowers white, pink, pinkish-purple or purple, posterior petals with dark purple, wine-red or dark red feather-like markings, fertile stamens 7 (4 long, 1 medium, 2 short). See Bothalia 15 (1985) 345-385 for details. alneum Hoffmgg. syn. cordifolium (Cav.) Curt. alutaceum Hoffmgg. syn. scabrum (Burm. f.) L'Herit. agulatum Link syn. cucullatum (L.) L'Herit. angulosum (Mill.) L'Her. syn. cucullatum (L.) L'Herit. balsameum Jacq. syn. scabrum (Burm. f.) L'Herit. betulaefolium Salisb. syn. betulinum (L.) L'Herit. betulaefolium Schrank syn. cordifolium (Cav.) Curt. cephalicum Hoffmgg. syn. scabrum (Burm. f.) L'Herit. cordatum L'Her. syn. cordifolium (Cav.) Curt. corymbosum Turcz. syn. tomentosum Jacq. crassifolium Hoffmgg. syn. crispum (Berg.) L'Herit. crataegifolium (Thunb.) Eckl. & Zeyh. syn. scabrum (Burm. f.) L'Herit. dregeanum Turcz. syn. cordifolium (Cav.) Curt. erectum Knuth syn. glutinosum (Jacq.) L'Herit. formosum Balb. syn. scabrum (Burm. f.) L'Herit. georgense Knuth syn. betulinum (L.) L'Herit. karooense Knuth syn. quercifolium (L.f.) L'Herit. lanatum (Thunb.) DC. syn. cordifolium (Cav.) Curt. marlothii Knuth syn. alpinum Eckl. & Zeyh. micranthum Eckl. & Zeyh. syn. tomentosum Jacq. penicillatum Willd. syn. betulinum (L.) L'Herit. piperatum Spin syn. tomentosum Jacq. piperitum F. G. Dietr. syn. tomentosum Jacq. populifolium Eckl. & Zeyh. syn. ribifolium Jacq. quercifolium L'Herit. syn. panduriforme Eckl. & Zeyh. robustum Knuth syn. papilionaceum (L.) L'Herit. rubrocinctum Link syn. cordifolium (Cav.) Curt. strictum Dietr. syn. crispum (Berg.) L'Herit. terebinthinaceum Spreng. syn. graveolens L'Herit. terebinthinaceum (Cav.) Small syn. graveolens L'Herit. therebinthinaceum Murr. syn. panduriforme Eckl. & Zeyh. therebinthinaceum Cav. syn. graveolens L'Herit. tomentosum Eckl. & Zeyh. syn. papilionaceum (L.) L'Herit. trilobatum Eckl. & Zeyh. syn. ribifolium Jacq. viscosissimum Sweet syn. glutinosum (Jacq.) L'Herit. viscosum (Scop.) Spreng. syn. glutinosum (Jacq.) L'Herit. viscosum Harv. syn. glutinosum (Jacq.) L'Herit.